A wild affair on a rainy night in Foxborough saw a TFC side depleted by injuries come back from three goals down to make a game of it, only to fall short and have their star scorer pick up a red card in a moment of sheer stupidity. Once again, a rash of injuries forced TFC coach Greg Vanney to shuffle his lineup. Among the absentees were forward Jozy Altidore, midfielder Nico Hasler, left full-back Justin Morrow, and central defenders Drew Moor, Eriq Zavelta and Nick Hagglund. A new wrinkle came in the form of right full-back Gregory van der Wiel not being named to the 18-man roster as a precaution – he was dealing with an Achilles issue. Van der Wiel has been forced to play in the centre of defence in recent weeks, alongside captain Michael Bradley, who normally plays in central midfield. With Van der Wiel out, Jason Hernandez partnered Bradley, with Auro Jr. and Ryan Telfer on either side of them. To call this backline makeshift would be charitable, but there’s not much Vanney can do other than wait for his injured players to get healthy again. That probably explains why he didn’t start centre back Chris Mavinga, who has only played one MLS game this season due to injury, and only brought him on as a second-half sub. The last thing Vanney wanted to do was rush the Frenchman back and have him play 90 minutes after such a lengthy injury absence. That might also be why Vanney started Victor Vazquez on the bench, and didn’t bring him on until the 70th minute. The Spaniard was subbed out at halftime of Wednesday’s loss to Seattle after suffering a knock to his knee earlier in the game. 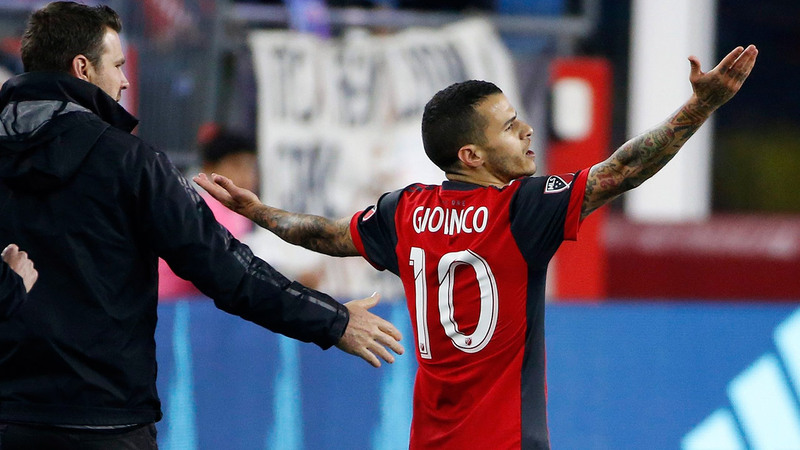 As for having Giovinco on the bench, Vanney presumably didn’t want to risk using the Italian on that artificial surface – a surface on which many TFC players in the past have suffered injuries – unless necessary. Down two goals with half an hour to go, the Italian entered the game. New England has always been a tricky place for Toronto to pick up points. Its last win at Gillette Stadium was in 2013, and the Reds have only ever won twice in 14 previous visits. The fact that Vanney didn’t start Giovinco, Mavinga and Vazquez will not sit well with a lot of critics. But considering TFC’s dire injury situation at the moment, one can understand why Vanney took a cautious approach with his player selections. Vanney is thinking about the long-term picture, not short-term gains. It wasn’t the best start on Saturday for the Reds, who conceded two goals inside the opening seven minutes. This continued a disturbing trend for Vanney’s team, as they have now coughed up six goals in the opening 10 minutes across five games in MLS and CONCACAF Champions League play this season. There was plenty of blame to go around on this night. Bradley’s pass to Ager Aketxe could have been more precise. The Spaniard could have moved for it, instead of standing still like a statue, resulting in a counterattack that ended with New England’s Cristian Penilla beating goalkeeper Alex Bono to open the scoring. Bono could have kicked the ball long while under pressure, instead of playing it short to Aketxe, who, in turn, didn’t have to make a careless, blind pass that was intercepted and turned into the back of the net by Penilla past Bono just seconds later. Seven minutes in, and the visitors were already down 2-0. In the second half, Aketxe (it really wasn’t his night) could have made a better effort in trying to stop Teal Bunbury before the New England forward unleashed a shot from the edge of the box that blew by Bono. Score quick in the first half. Score quick in the second half. Down 3-1, Vanney brought on Giovinco in the 60th minute. His introduction, along with Mavinga and Vazquez also being subbed in, changed the complexion of the game. TFC started to boss New England, and looked like its regular self, thanks in large part to Giovinco’s dangerous play up front and Bradley being moved back into his normal central midfield role. Auro Jr. drew a foul late in regulation, and Giovinco stepped up and duly converted from the penalty spot to make it a one-goal game. But as the Italian rushed back to the centre line, New England’s Wilfried Zahibo tried to knock the ball out of his hand. Giovinco responded by putting his hands in Zahido’s face. Alerted to the incident by the video assistant referee, the on-field official issued a red card to the TFC forward for violent conduct after reviewing the play himself. There’s no question that Zahibo provoked Giovinco, and that the New England midfielder should have earned a yellow card. As it turned out, he didn’t. That doesn’t change the fact that Giovinco acted out of petulance and selfishness in his response. You can’t put your hands on an opponent’s face. You simply can’t. The Italian has to show composure and restraint in such heated moments, and not let his emotions get the better of him, like he has done so often in the past. His act of stupidity – let’s not sugar coat it, it was an incredibly stupid thing to do – means TFC will now be without him and Jozy Altidore for next Friday’s home game against Orlando City. Giovinco has to get over his growing sense of entitlement and focus on playing the game. 90’ RED CARD! Toronto 2, New England 3: After converting from the penalty spot to pull TFC within a goal, Giovinco was shown a red card (upon VAR review) for violent conduct. Toronto still needed a goal, and time was running out. But you never know – had the Italian stayed on the pitch, he might have helped his side nick the tying goal. TFC have only won twice and collected a meagre seven points through their first nine games of the season. They’re sitting on a minus-6 goal difference, and they’re dogged by injury problems. Things might look bleak, but they’re not. You can’t properly judge the state of this team when they’ve been missing so many key players. Once the Reds get healthy again, they’ll be fine. They have games in hand on most teams in the Eastern Conference. The Reds suffered slow starts to the 2016 and 2017 campaigns, and both times they recovered to make it to the MLS Cup final. Remember: It’s May 12. There’s plenty of time for them to close the gap and get back into the playoff race. Every time #TFC play the Revs, I think back to the 2013 draft when they could have picked Andrew Farrell. Instead, TFC traded the top pick and ended up selecting Kyle Bekker. Farrell has played 169 MLS games and averaged over 30 games per season. Bekker never caught on in MLS. Saturday marked TFC’s sixth loss of the 2018 MLS campaign. The Reds lost only five times in the league last season. Teal Bunbury, New England: He effectively lead the line, causing all sorts of problems for Toronto’s defence before being subbed out in the 82nd minute. Before then, Bunbury managed to score one goal, and helped set up another. He also had other scoring chances that he didn’t finish off.